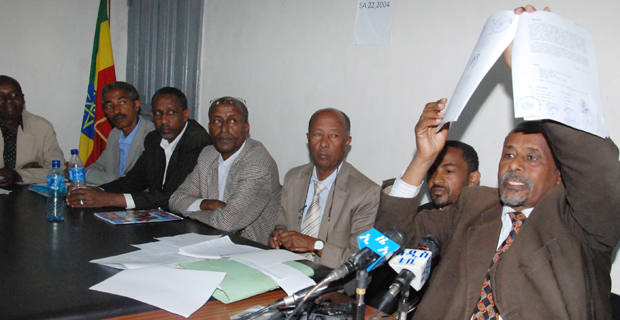 The 33 petition signing political parties denounced the response of the National Electorate Board of Ethiopia (NEBE) to their request to discuss the upcoming Addis Abeba and Dire Dawa cities election on Thursday, December 27, 2012. One of the issues raised on the press conference organised at the head office of Forum for Democratic Dialogue inEthiopia(Medrek) located around Sidist Kilo on Weatherall Steet was related with the impartiality of the National Electoral Board of Ethiopia to monitor the election process freely. Two weeks ago, the NEBE announced that the claims of these parties presented to it are not justified with evidence. However Gebru Gebremariam (right) member of the parties said that the parties have enough evidence to back their claims. The parties called the public and the international community to closely observe the actions the NEBE is taking. Woundemagewe Deneke (middle) and Aserat Tasse (left) also attended the press briefing.